"I strongly emphasize that every individual should get an opportunity for education & adequate training to explore their potentials so that they can contribute in the social development by utilizing their intellectual skills in a best possible manner. With this thought and a firm belief that the upliftment of society lay in liberating its womenfolk as well as by providing them with opportunities for Higher Education in professional studies, we are in process to start our institution KB Women's College of Technology and Management (KBWCTM)." The government of Uttar Pradesh, established Avadh University, Faizabad, initially as an affiliating university by it's notification No. 1192/fifteen-10-46(6)-1975 dated 04 March, 1975 and appointed Prof.(Dr.) Surendra Singh as the first Vice chancellor. 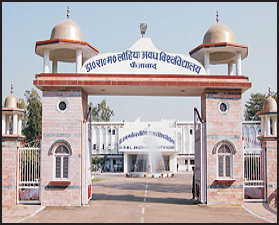 In 1993-94, it was renamed as Dr. Ram Manohar Lohia Avadh University, Faizabad in the memoriam of late Dr. Ram Manohar Lohia, an epic socio-economic ideologue and freedom fighter par excellence. The university initially started its office in a rental building at Civil Lines, Faizabad. Land acquisition process for varsity's formal office started in 1976. Ultimately, the then Chancellor and the Governer of state Shri G.D. Tapase laid foundation of the present administrative building of the varsity on 02 May 1978. Principle of Management Organization Behavior Computer Architecture & Assembly Lang. Operating System Computer Network Information Sys. Analysis Desg.